Over the last 7 days, the Greater New York Red Cross provided emergency assistance to 97 adults and 41 children following 45 local disasters. Here are some highlights from last week and a preview of upcoming activities (see below). Last week, the Greater NY Red Cross continued to support disaster relief in Texas, the US Virgin Islands, Florida, Puerto Rico, and California. For a more personal look at these historic disaster responses, please follow: Oonaugh Turrito, Neela Lockel, Bruce Vesloski, Joe Spaccarelli, Steven Colon, Cedric Davoren, Vivan Moy, Gary Chin, and Daniel Delgado. On Saturday, we had more than 40 volunteers install almost 500 smoke alarms for the senior community of Leisure Village in Long Island! Our regional CEO Josh Lockwood spoke on Fox5 Friday evening about heroism in Las Vegas post-shooting. Earlier in the week we posted a video highlighting some of the help the Red Cross and New York Disaster Interfaith Services (NYDIS) were able to provide recently to two NYC families struggling with Sandy recovery. 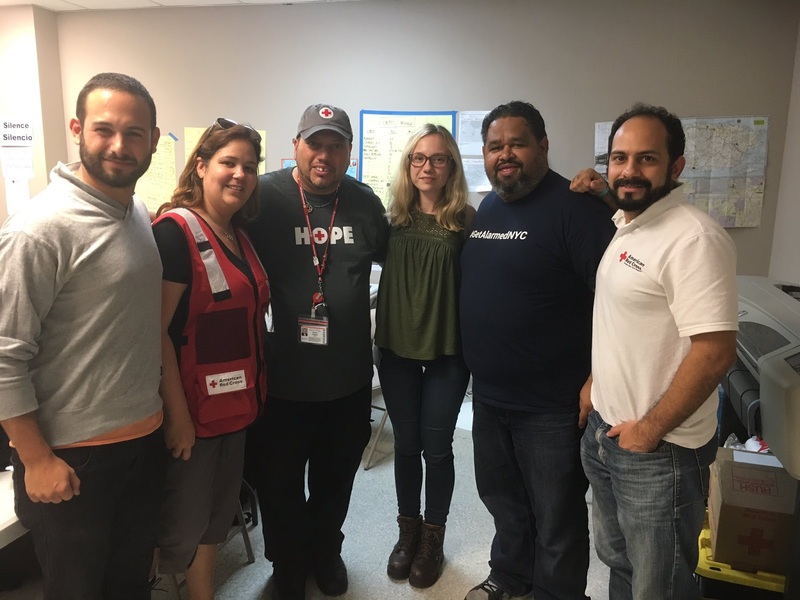 Check out our blog post about how our volunteers have supported Red Cross responses around the country these past three months. Thank you to all who have been and are still deployed! Last month, Red Cross Services to the Armed Forces attended the Northport VA Medical Center "stand down" event on Long Island. These events help give veterans access to services, resources and referrals. For more information on how to help, feel free to send an email to safgny@redcross.org. Nov 3, 4, 6: Red Cross blood drives will take place from 2 to 7 p.m. at the Greater NY Red Cross building located at 520 West 49th Street, Manhattan. Schedule an appointment to donate today. Nov 5: Cheer on Amanda, Anastasia and Team Red Cross as they run the TCS NYC Marathon to benefit the Red Cross. Dec 13: The Home Fire Preparedness Campaign will be in Brentwood on Dec 13 installing free smoke alarms from 10 am to 1 pm. For an appointment, please call 516-229-1086 or visit redcross.org/lifiresafety.